This is my own interpretation that follows Hibler and Kappen's book on So Called Dollars ("HK") first published in 1963 and republished in 2008. It does not involve the "monetary" so called dollars (HK777 through HK873), as they are not open to the interpretation problems that the commemorative pieces sometimes are . I suppose to some readers this explanation may seem a bit long-winded, but hopefully it will help shed some light on this enjoyable but difficult to define area of numismatics. As a so called dollar collector I have never followed HKs guidelines to the letter, and I doubt the authors ever intended the book to be used that way anyway; but for the most part I think that the author's decisions, all things considered, were reasonably good. For me the book has served as a good foundation for collecting these interesting and varied medals and tokens, and since it's publication in 1963 it has obviously been the major influence on everyone who has collected them. A so called dollar is a medal or token that is commemorative in nature on at least one side. It should have a strong United States commemorative theme and measure 33 to 45 millimeters in diameter. Most collectors stick with pieces made prior to the early 1960s. For a few examples of post 1960 so called dollars, CLICK HERE. A famous American PERSON. Section C Part 2 beginning on page 145 of the 2nd edition of HK is supposedly the "famous persons" section, but many examples are scattered throughout the book, with the famous individual usually being associated with an event of some sort. Medals that solely commemorated the life or death of a president(or the anniversary of his life or death) were generally not included in HK (Examples). Presidential inauguration pieces were also not included. Presidential pieces were often included if the pieces also commemorated public events. The reason that presidential pieces were not usually included was no doubt due to the large number that exist, and to the fact that many had already been cataloged elsewhere prior to HK being published - Baker's book for Washington medals, King's listing of Lincoln medals for instance. A public PLACE. There are a number of undated souvenir pieces that fall into this category. Examples: HK343a, HK620, HK717a through HK730, HK753. A corporation or business organization. These pieces may be somewhat controversial, probably because of their possible advertising nature. I stick with corporate anniversaries. Examples: HK731 through HK749. no political campaign medals or tokens, although the Bryan dollars (HK777 through HK786) could be considered exceptions in a sense. no calendar medals or tokens. Some are mechanical which is probably why ALL were excluded - akin to throwing the baby out with the bath water). There are not a whole lot of these anyway. no emergency money as mentioned in HKs introduction, but I personally do not know of any emergency money (script, tokens etc.) that could be confused with a so called dollar. Bryan money??? no Betts medals. There are a few Betts medals that could probably be called the earliest so called dollars (Look at Betts 546 and Betts 617 - Baker 58), but like campaign medals, inaugural medals, US Assay medals, and many George Washington medals, Betts medals were cataloged before HK was published, and they have a long tradition of being called what they are called, and it is probably best that things stay that way. medals with non English inscriptions were excluded from HK unless the medal also existed as an English version(HK386-HK388). Personally I think this is untenable. In the late 1800s to the early 1900s there were many communities in America where the predominant language was something other than English. Excluding such pieces simply because they are non-English probably does not make any sense. Note that if one side of a piece had any of the above exclusionary themes, the piece was usually not included in HK even if the opposite side commemorated a public or special event etc. The following themes however were generally allowed on one side of a piece as long as the opposite side commemorated a public event. These themes can be called "neutral" in nature, neither causing a piece to be included or excluded from HK on it's own accord. Fraternal organizations etc. These were not mentioned in HK's introduction, and some collectors tend to feel that fraternal themes are exclusionary irregardless of what is on the other side. Mason and GAR(Grand Army of the Republic) pieces are perhaps the most common fraternal pieces. For examples that were included in HK, look at HK37 and HK46. For examples that are mostly fraternal in nature on both sides and thus were not included in HK, click Here. But also, read below about "Section C Part 3." Good luck themes. Examples: HK433, HK469, HK470, HK470a, HK474, HK474a, HK707. "Aluminum" the 'new metal" theme. Examples: HK159 through HK163, HK258, HK259. Presidents of the United States(as elaborated on above) Examples: HK30, HK32a, HK42, HK65, HK70a, HK70b, HK71, HK125a, HK136, HK145, HK146, HK244a, HK275, HK278, HK279, HK308, HK449. A "good for $1.00" trade token from a public event. The only example in HK is HK689. Click HERE for the only example I know of from a major worlds fair. Pieces like these are sometimes refered to as "Souvenir" trade tokens, or sometimes "Municiple" trade tokens in the case of those associated with city or county public events. This is in contrast to more typical "store card" trade tokens meant to be exchanged at a specific business. 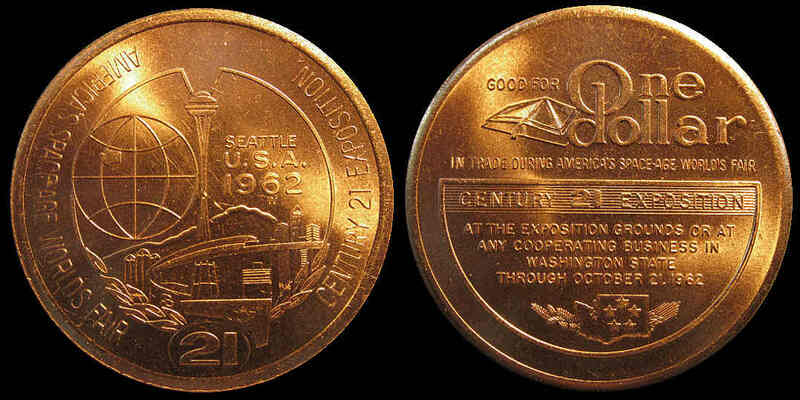 There are actually not very many dollar "Souvenir" trade tokens prior to 1960. After 1960 there are more, but even more common are "good for 50 cent" souvenir trade tokens. These latter pieces are often of so called dollar size(over 33mm), but due to their "50 cent" theme, they are usually excluded as so called dollars. In the past I have heard some some people suggest that HK689 should have been excluded from HK because of it's trade token nature. I disagree. The key here for me is that they are a trade token from a PUBLIC EVENT. And imagine that you are a potential young numismatist walking the bourse floor and someone tells you that HK689 or a piece similar is not a so called dollar, but then shows you a Lesher Dollar (with $1.25 on it) saying that it is the ultimate and "true" so called dollar. Your next thought might be "Are coin people a little? crazy?" A blank reverse. This is pretty obvious. Examples: HK237, HK476, HK517, HK536, HK537, HK544 etc. A patriotic or political theme. This is a bit hard to decide upon, but usually patriotic or political themes did not in of themselves cause a piece to be included in HK, but some in section C of HK may fall into this category; and read about HK114 below. State and City seals.Examples: HK599, HK601, HK621 HK634 etc. Also no holed or looped pieces were included, HK numbers 2 through 4 being the exceptions(The 1st edition of HK states numbers "1 through 3" which is a misprint). Personally I tend to stay away from looped or holed so called dollars. I question whether there was once an attachment that is now missing. And was an attachment removed in order to have it slabbed? Can holed pieces without an original attachment be considered damaged? I guess the market will decide. With regard to many of the categories of pieces not included in HK, a quote out of HK's introduction is important: "Some of these latter subjects, of course, have achieved an importance of their own and either have been treated by competent authorities or are worthy of such attention. In other cases, the material proved too abundant to permit proper consideration here." Lastly, to make things interesting, the authors of HK occasionally appear to have stretched or even broken their own rules, but there were often good reasons. What follows is a discussion of most of these pieces. HK2-4: Although only found holed, it was included because of it's high historical and numismatic importance. It is the only Numismatic artifact from the 50 year anniversary of the signing of the Declaration of Independence. Also it is evidently never found with an original attachment. HK8: This is a foreign piece that commemorates the 2nd Crystal Palace in London built at Sydenham, not the first Crystal Palace in London at Hyde Park, and certainly not the Crystal Palace in New York, so perhaps the authors of HK should not have let this one in. It is obviously not of US origin or theme. HK9-10: This event was held in Great Britain, but involved an American fighter with a large US following. Also, the medals were made in New York. There is also a companion piece with Thomas Sayers that is not included in the 1st edition, but is included in the 2nd edition. HK35-36: A school medal on the reverse even though Hibler and Kappen's introduction specifically states "no school medals"; but it is also a bit religious("Baptist") too, which was also an excluded theme. HK114: This piece never seemed to me to quite fit HKs criteria due to it's totally political/patriotic theme, but I never really questioned it's inclusion because of it's association with the U.S. Centennial Exposition. Then I read Joe Levine's comment in his 39th PCAC sale lot#618 that made me think that this piece should have not been included at all. He states: "HK erroneously attributes this to the 1876 Centennial period. It is a good bit earlier"
HK149: Sort of "advertising" in nature on the obverse, but a worthwhile inclusion nevertheless. HK296: This is a "corporate" commemorative, and perhaps it could have been included with others of a similar nature, but it also commemorates an important part of American western history. HK297-298: Advertising in nature on the reverse. I'm sure that the reason this piece was included was because it is such a nicely executed and substantial medal, unusual for an advertising/store card type piece. It is also perfectly sized for a so called dollar. HK353-356: This is the smallest so called dollar listed in HK (excluding the gold dollar pieces). It measures 32.1mm which breaks the minimum size rule of 33mm. It was no doubt included because of it's significance as an official world's fair medal struck by the US mint. HK434: Advertising in nature on the reverse again, but was included anyway, I guess because the other side commemorates a world's fair. As stated above, there are a lot of other pieces like this one that were not included in the book that are advertising in nature on one side, and commemorate a world's fair on the other. HK465 and HK466: Once again advertising in nature on one side. HK534-541: Like HK149 in nature. HK733: Obvious advertising piece on one side, and partially so on the other side too. There are actually four or five other varieties of this piece, but the one listed in HK is the only one that goes beyond a strict advertisement by commemorating the "100th Anniversary Mechanics Fair Boston". I wish the original authors were still alive today so I could ask them what their reasoning was for putting this piece in. Were they leaving the door ajar with the idea that maybe advertising pieces might be OK as long as they commemorate a public event on the other side? HK755: A trade association piece, but without a date. Sort of unique I guess. HK832: Obvious silver dollar design, but no one knows for sure why it was made. HK states that this is the most controversial piece in the book. Section C Part 3: This is HK's "miscellaneous" section. Some of these pieces are difficult to classify. There are a number of pieces regarding America's participation in World War One. These all seem legitimate under HK's guidlines. The Denver 1905 piece(HK876) also seems perfectly legitimate. The Loyal League piece(HK874) and the KKK pieces(HK908, HK909) are both completely political/fraternal in nature and thus are a bit dubious, especially in light of the fact that no entirely Masonic or Grand Army of the Republic pieces were included in the book. HK877-891 are all political in nature, but were included because of their association with Thomas Elder. Thomas Elder was an historically important numismatist. His medals are usually quite rare and often sought after. The Swift pieces(HK905-907) are somewhat unique. Their inclusion I guess is obvious from the standpoint of their "dollar" theme. There are also a few unlisted pieces that have a similar theme. The reverses of HK483 and HK484 are also sort of similar. The United Nations piece(HK914-915) is an undated souvenir token and the only "spinner" in the book. The very last piece (HK916-917) is totally patriotic/religious in nature, commemorating God, freedom and the grand old flag.